Wallpaper magazine voted it as the best new restaurant. Banq restaurant is located at the base of the old Penny Savings Bank, in an early 20th century building abandoned for years in Boston. After the building’s reconstruction two segments emerged, the front area programmed to be a bar and the larger hall which would serve as the dining area. Office dA managed to overlap any structural problems and create a fancy restaurant out from an abandoned place. Find out how inspiration can help a project find its place in the world’s best restaurants list. Located in the old Penny Savings Bank, Banq is a new restaurant located at the base of the old banking hall. Divided into two segments, the front area on Washington Street is programmed as a bar, while the larger hall behind serves as the dining area. The design of the space, however, is conceptualized around another division, on the z axis, between the ceiling and the ground. 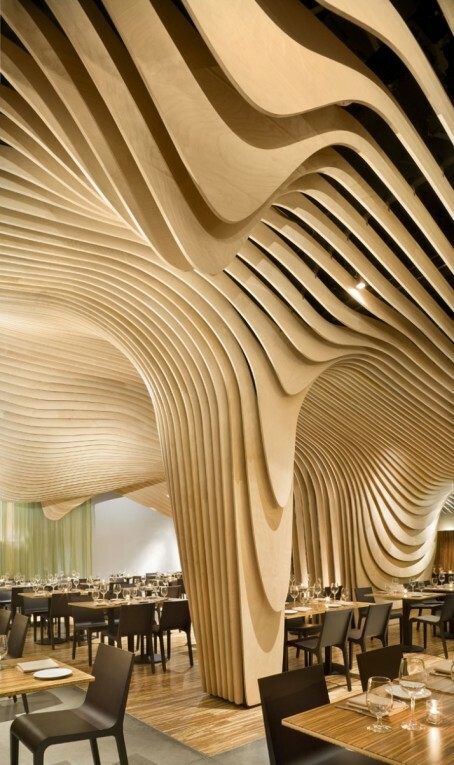 If the ground needs to remain flexible as a result of fluctuating activities of the restaurant space– two seaters, fours, and sixes, among a range of other organizations related to parties and other events– then, the ceiling contains fixed programs that are part of the building’s infrastructure– the structure, drainage, mechanical equipment, sprinkler system, lighting, and other the acoustic systems. 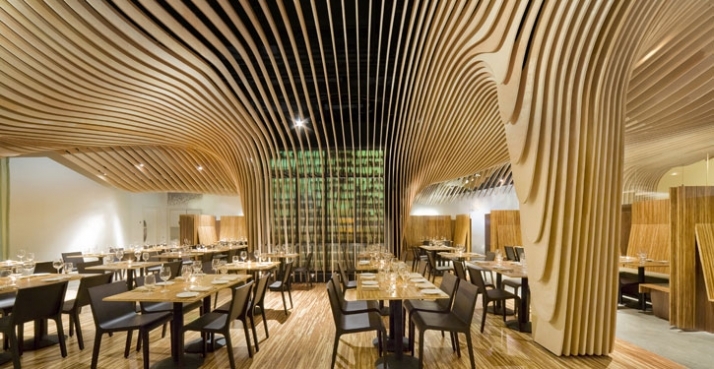 To that end, we have developed a striated wood-slatted system that conceals the view of the mechanical, plumbing, and lighting systems on the longitudinal axis, while offering a virtual canopy under which to dine. The geometry of the wood slats conform to each equipment above, but are also radiused in order to smoothen the relationship between other adjoining equipment, creating a seamless landscape. The columns and the wine storage, in the middle of the hall, serve to uphold the fiction, and appear to be suspended from the ceiling. 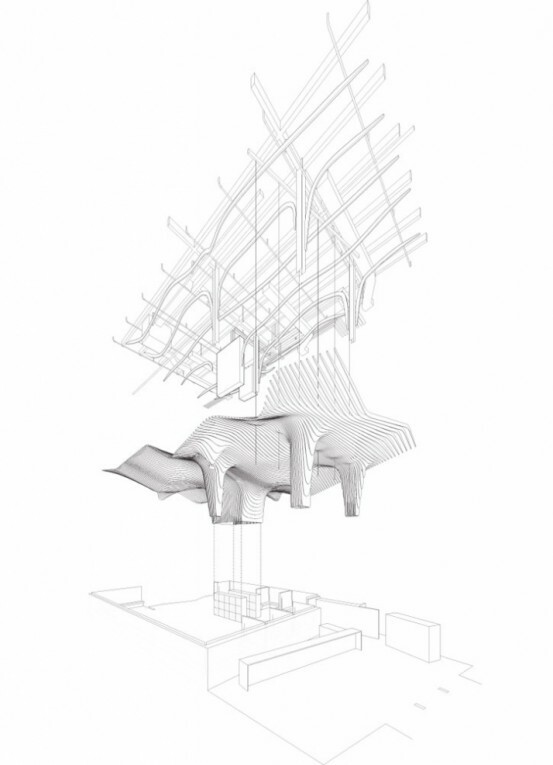 if the longitudinal axis emphasizes the seamless surface, then lateral views offer striated glimpses into the service space above, and demystify the illusion. To underline this strategy, certain areas of the ceiling “drip” and “slump”, acknowledging the location of to place exit signs, lighting features, and other details. 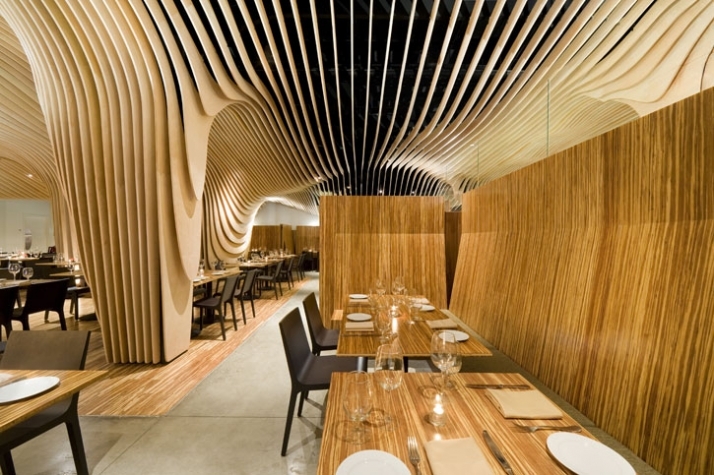 Below the ceiling, the functional aspects of a dining space are fabricated with warm woods and relaminated bamboo amplifying the striping affect already at play throughout the space. 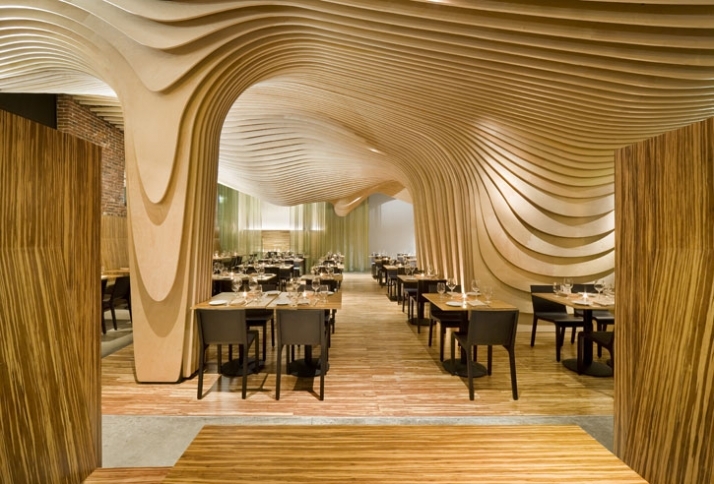 Striations of the ground, the furnishings, and the ceiling all conspire to create a total effect, embedding the diners into the grain of the restaurant. 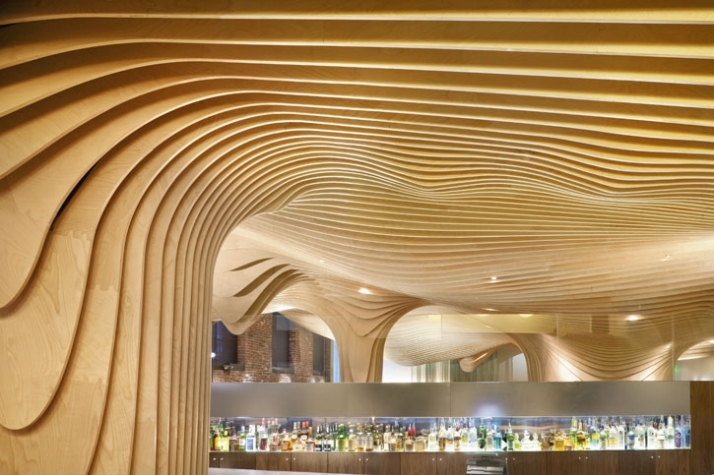 Acknowledging the historical setting of the building, the ceiling hovers away from all interior walls and instead finds its support in suspension from above. 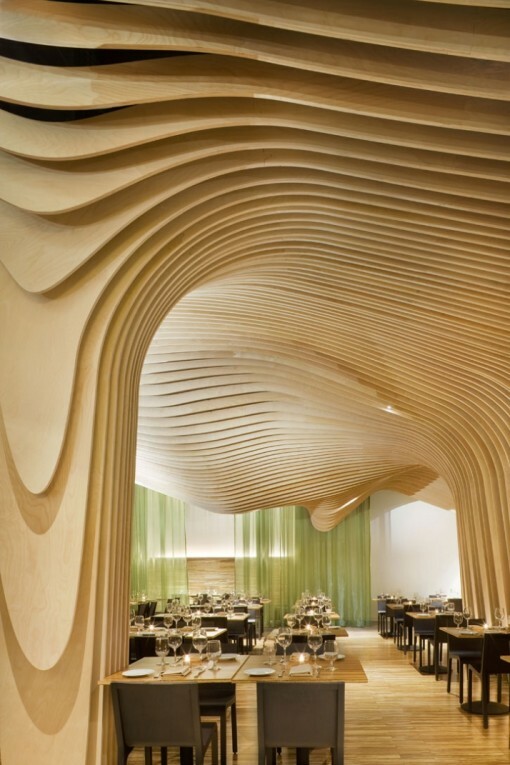 Nearly running the entire width of the space, each rib of the undulated ceiling is made from unique pieces of three-quarter-inch birch plywood adhered together in a scenario that likens to a puzzle; only one possible location for each unit, formulating the continuous member. These continuous members are fastened to the main structural ribs running perpendicular to the lattice, tracing both the overall ceiling topography and the steel supports of the base building. 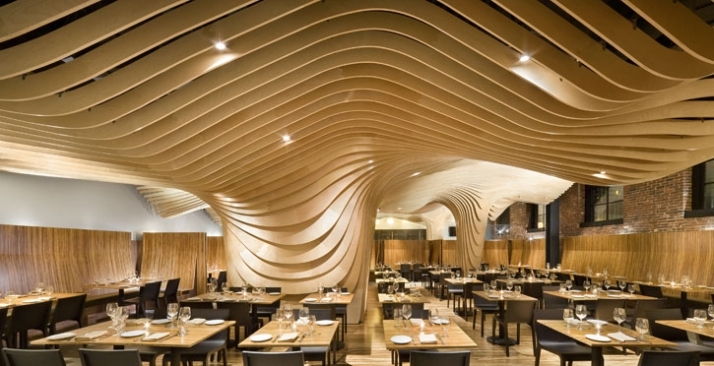 Spacing between the visible ceiling ribs is variable; compressing and releasing to maintain visual densities of the overall surface as seen from different angles. Architect / Office dA, Inc. Structural Consulting Engineer / Simpson Gumpertz & Heger Inc.
MEP Consulting Engineer/ Wozny/Barbar & Associates, Inc. Kitchen Consultant / TriMark USA, Inc.
Quality posts is the main to invite the visitors to pay a visit the site, that�s what this website is providing.